This page traces the history of the highway itself – also see Highway 7 Buildings. The segment of Highway 7 that runs through St. Louis Park was built in 1934, opening that November. See the article at the bottom of this page for the announcement in the Minneapolis Journal. Like Highway 100, Highway 7 was constructed with WPA-funded labor, with as much work done by hand as possible. Engineer C.F. Graeser, who would orchestrate the upcoming work on Highway 100, was the supervisor of Highway 7. As a works project, there was a movement to use horses as much as possible on rural jobs. 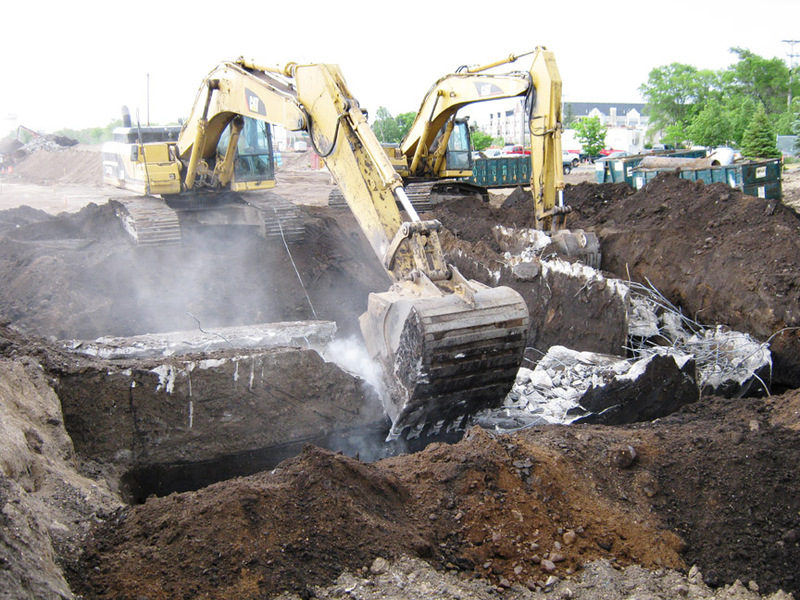 Construction equipment included three mule teams and “belly dump wagons” to move the dirt. Wood from downed trees (formerly the Williams Homestead) was provided to poor families for fuel. The route went through an area in front of the high school that served as an ice rink and football field. These were moved west of the school. 1937 statistics showed that the new road carried 3,547 vehicles daily; Wayzata Blvd. carried 6,653. 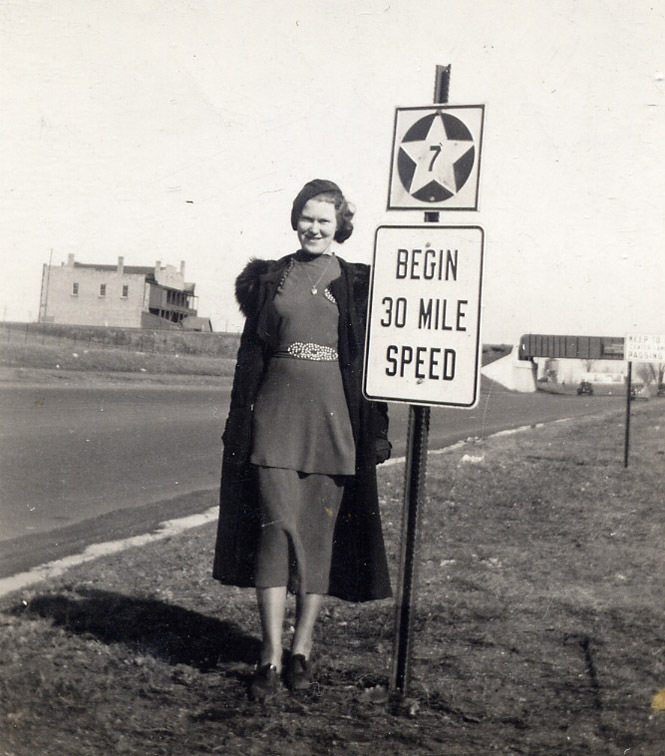 The picture below is of Marie Hartmann next to a Highway 7 sign dated March 21, 1937. As parents learned more about the new Highway 7, they became concerned for the safety of their children. Junior and Senior High school students in the 1930s often had classes in both Lincoln School and the Jr./Sr. High School, which required them to cross the new road. On October 19, 1932, the PTA appealed to the Village Council to build a tunnel that would go under the highway. 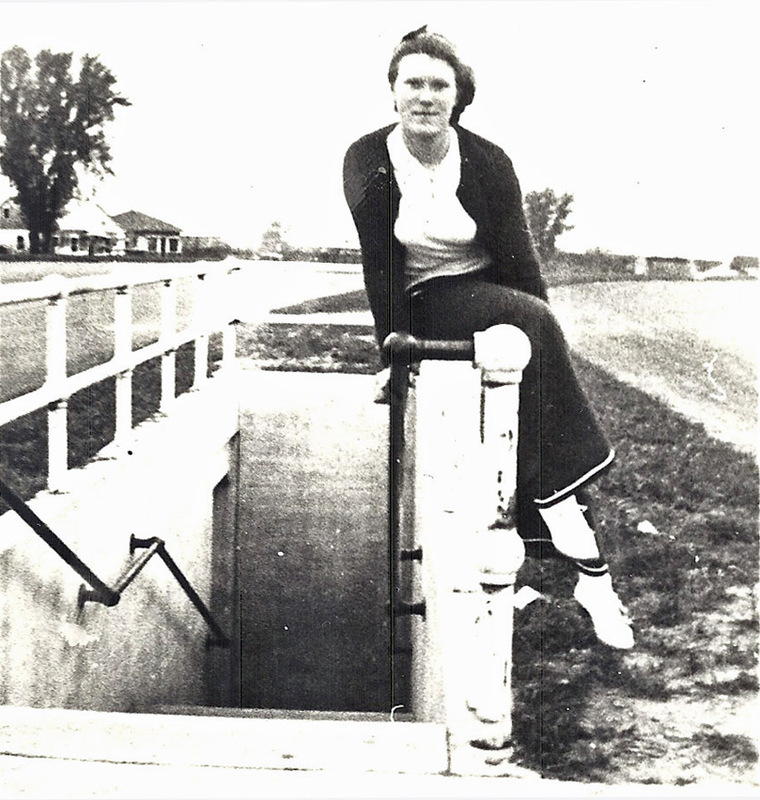 The picture below is of Marie Hartmann at the tunnel, dated June 1937. 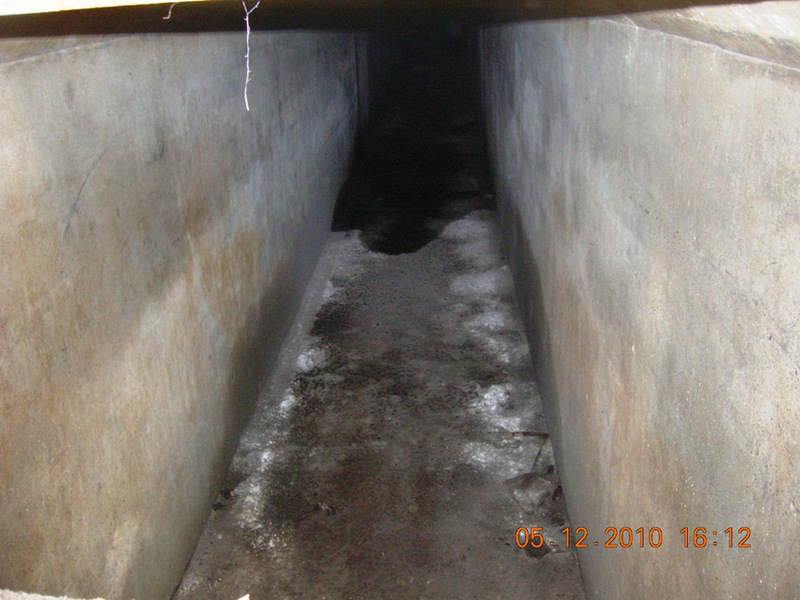 But kids will be kids, and the tunnel quickly became a dirty, disgusting pigsty, where more kids went to relieve themselves than to relieve their parents. Although Bob Jorvig remembers it being fun to go through the tunnel as a boy, others (especially the girls) refused to use it and it was declared unfit for human perambulation. For those reasons it got blocked off with railroad ties and the ends were filled in (we know not when; someone posited the date March 8, 1950, Keith Meland guesses 1967 when the road was realigned and rebuilt), and we thought it was gone forever. 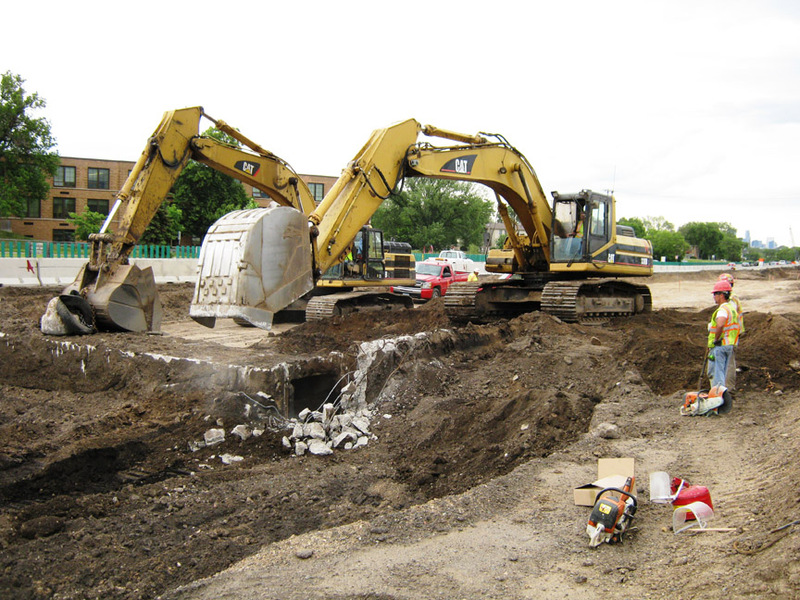 But it turns out that when Mn/DOT built the Wooddale Ave. overpass over Highway 7 in 2010-11, they encountered the tunnel! We thank Jay Koski for taking the pictures below in 2010 and sending them to us. He said they had heard about it, but didn’t know where it was until they dug it up. 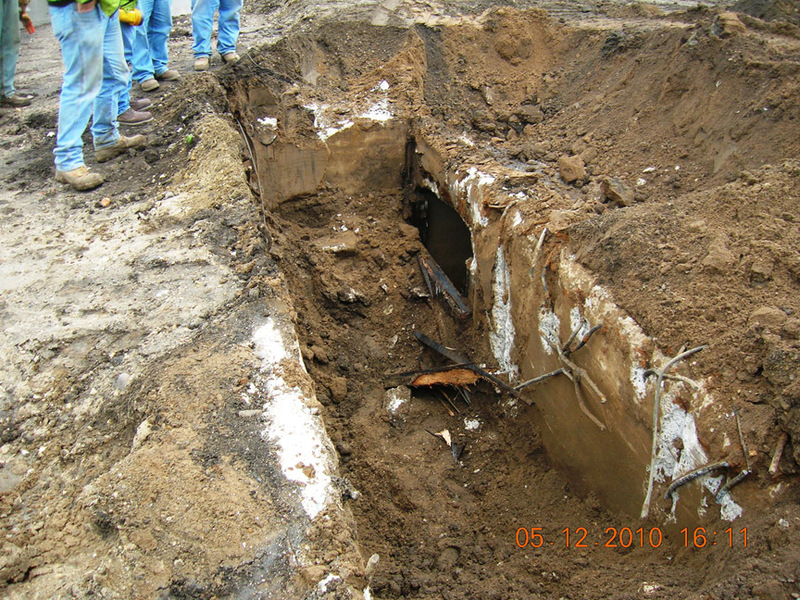 Those Creosote boys did a good job – the railroad ties were in perfect condition. The intersection of Highway 100 and Highway 7 was one of the country’s first examples of what was termed a cloverleaf. 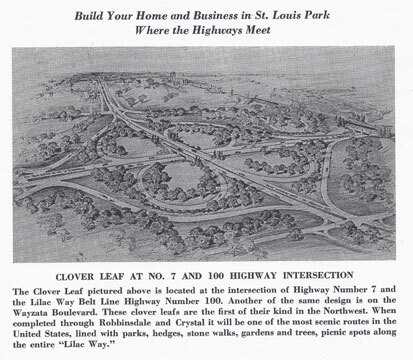 (The cloverleaf at Highway 12 was the first one on Highway 100.) We don’t know exactly when the cloverleaf was opened, although it can be seen under construction in aerial photos taken in the summer of 1937. The daughter of plumber Clifford J. Browne, President of the St. Louis Park Businessmen’s Association, remembers that her father cut the ribbon for the opening of the Highway 7 cloverleaf. She also remembers riding her bike around the four circles of the cloverleaf that day. The cloverleaf required 30 acres and cost $65,000. The photo below is from the 1941 directory. The Oak Hill School PTA secured a “Caution” sign for the highway during the 1935-36 school year. On September 1, 1939, 3M’s Scotchlite product was used on traffic control signage and installed at the cloverleaf. The first automatic traffic signal was installed at Highway 7 at Quebec. The third such signal was at Highway 7 and Wooddale, installed in October 1950. In May 1965, a signal was installed at Lake Street. Something new in the way of an emergency landing field was created in Hopkins Monday night when a light, two-passenger plane landed on Hwy. 7 in front of the Homedale nursery. Out of gas and too far from a suitable landing place, two Montana fliers set their plane down on the highway at 6:30 pm, just after the usual evening rush of traffic. Flying to Minneapolis from Fort Benton, Montana, George Humphrey and Hardy Sandvig, a former transport command pilot, report they had refueled at Mobridge, S.D., but that their tanks had not been properly filled, and they had no knowledge of their serious situation until they had to find a landing spot without delay. After settling down on the pavement, they wheeledd their light Luscombe plane into the Homedale driveway. The two men took off again Wednesday afternoon, after spending two days trying to get clearance from CAA authorities for their take-off. Chief Enger Johnson and county and state highway patrolmen blocked off the highway before their departure. In 1958 City Councilman Torval Jorvig requested that a committee be formed to give Highway 7 a name, presumably like Wayzata Blvd. or the Beltline. The committee came up with Alaska Boulevard, St. Louis Park Boulevard, and Radisson Road. No action was taken. A plan for upgrading Highway 7 was presented to the City Council in April 1960. The City Council approved a light at Highway 7 and France in 1962. A proposed interchange of Highways 7 and 18 was presented by Hennepin County Highway Engineer L.P. Pederson on August 22, 1963. The City Council approved the plan in November. In 1963, residents requested a traffic light at Highway 7 and Lake Street. Apparently it was still being discussed in 1965, and finally put in in 1967. An overpass was built at Wooddale Ave. in 2010. A three-ringed traffic circle was built at Louisiana Ave., sending drivers down, under, and around the area. Highway 7 was free of traffic lights from Highway 7 to Texas Ave.
Minneapolis’ latest highway, connecting the city with the popular Lake Minnetonka section, has just been opened – a section of state Highway No. 7. The final oiling of the east end of the highway was being completed last week, it having been delayed somewhat by cold weather. Leaving Minneapolis on the new highway the driver goes on Lake street west to the city limits at France avenue and then turns to the southwest. A section through St. Louis Park has a landscaped boulevard and is paralleled on each side by service roads, which are 22 feet in width and designed to give easy access to and from the highway by residents living along or near it. At various sections of the new highway where there are small centers of population these service roads have been provided. At important corners driveways have been provided for buses, so that passengers may be handled without inconvenience to themselves or to passing traffic. The highway swings through the northern part of Hopkins and between Vine Hill and Excelsior is built on the old right-of-way of the Minneapolis-Excelsior streetcar tracks which were abandoned three years ago. The road embodies the latest in highway construction and is designed for high speed traffic. The highway provides six lanes of traffic, it being 60 feet in width, exclusive of the service roads. There are no grade crossings. In order to provide this, it was necessary to construct five underpasses or bridges over railway tracks. At one point near Vine Hill, seven acres of land was acquired to obtain sand and gravel. This area is now being made into a park. All along the highway the cuts and fills have been beautified, extra funds having been acquired from the government in order to landscape the stretch along the highway. There are no ditches at the side, the drainage being taken care of through concrete pipes. At the side of the road there is a slight elevation, which will provide a path for pedestrians. Greater speed is obtainable on the new highway because the maximum grade is five per cent and the maximum curve four per cent. The sweeping curves give a driver a vision of the highway many feet ahead. Tests have shown that at least 20 minutes driving time can be saved between Minneapolis and Excelsior, the old highway having a number of grade crossings, sharp curves and narrow stretches which slowed down traffic. The new road is one mile shorter. Traffic counts of the old highway show at least 3,000,000 cars a year will use the new highway, which, with the mile saving, means that 3,000,000 car miles annually will be saved by the motorist. At an operation costs of five cents a mile, this will mean a dollar and cents saving of $150,000. C.F. Graeser, resident engineer at Hopkins of the highway department, who had supervision of the work on the new road, said that with the completion of Highway No. 7 to the west a short, through highway from South Dakota and western Minnesota into Minneapolis will be provided.